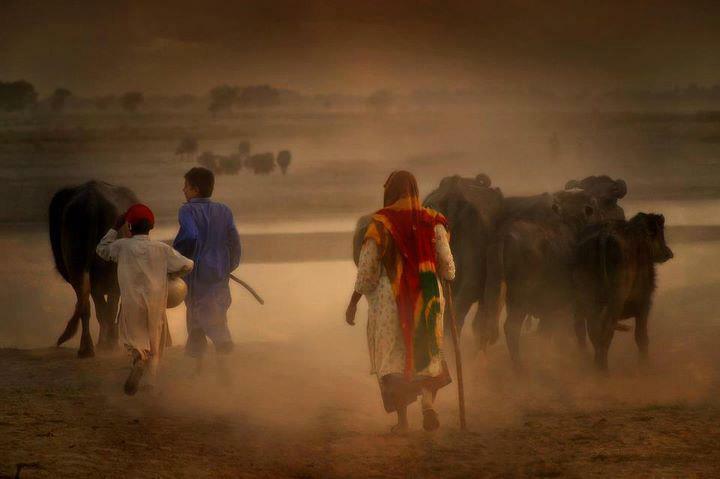 A villager and his two sons with their buffalo-stock on their way to the meadows. A daily village chore that turns the dusty track into a painting-like blend of dust mist with lush green fields under a hazy sky. Note for WoP readers: These village scenes are excellent. You will need to click on the image source at bottom of this page.That will take you to Nikokidos website. 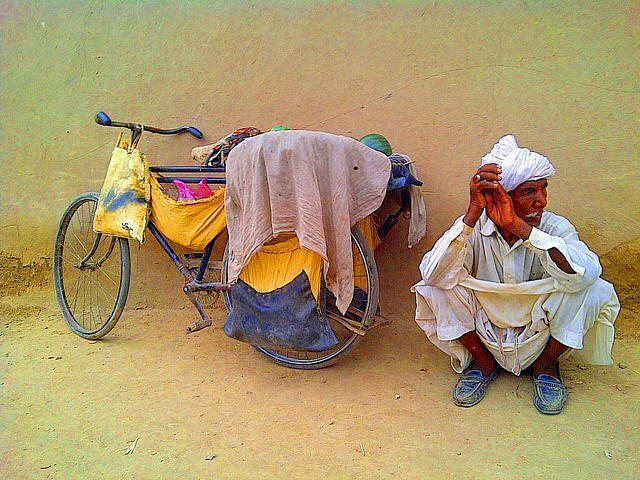 While there, you can see more images of the life in Punjab. If you may so wish, you can also subscribe to the website and get regular emails to see their contents which are usually excellent. Nikodikos is part of the Yahoo group. 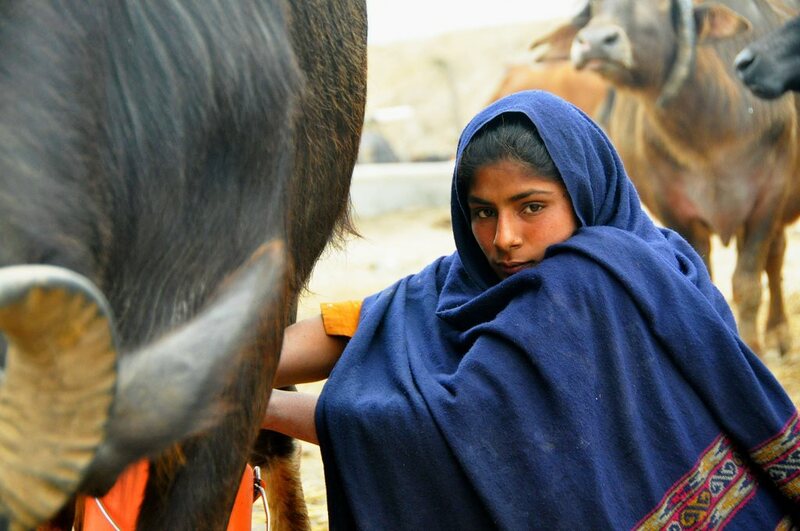 Before I put up now the snaps from village life in Pakistan, do see our previous articles in the series. [if you have not read them already]. For this you will have to go again at the bottom of this page to see the individual links under ‘You might also like’. But I always was looking for some excuse to go. The truth is that my village was the real reason. My village was a place of pilgrimage. How exciting it always has been to just listen to its name. It seemed like their branches were giving me a signal to come close. Standing under their shadow was heavenly. Today, I will again walk by those trees. Their branches are giving me a signal to come close again. Standing under their shadow is heavenly. Today, I will again walk to my village, my trees. [From Jagrate. Translated by SHR]. Life in Pakistani villages is a mix of variety of bird, animal and insect life in and around the shady trees, an ambiance that guarantees symbiotic relationship between all these three creatures, a chain of life, the interdependence of all living things. 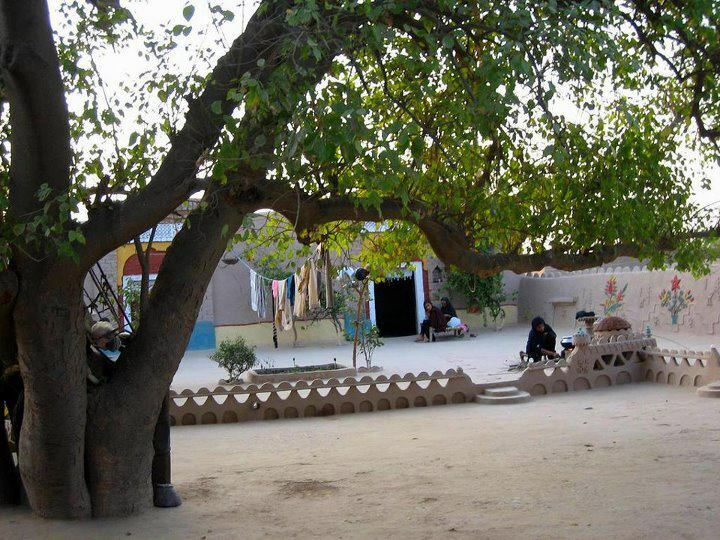 Apart from being an invaluable lesson in ecology, trees in Pakistani country side offer also a fascinating visual experience. A picture is worth a thousand words and this says it all. 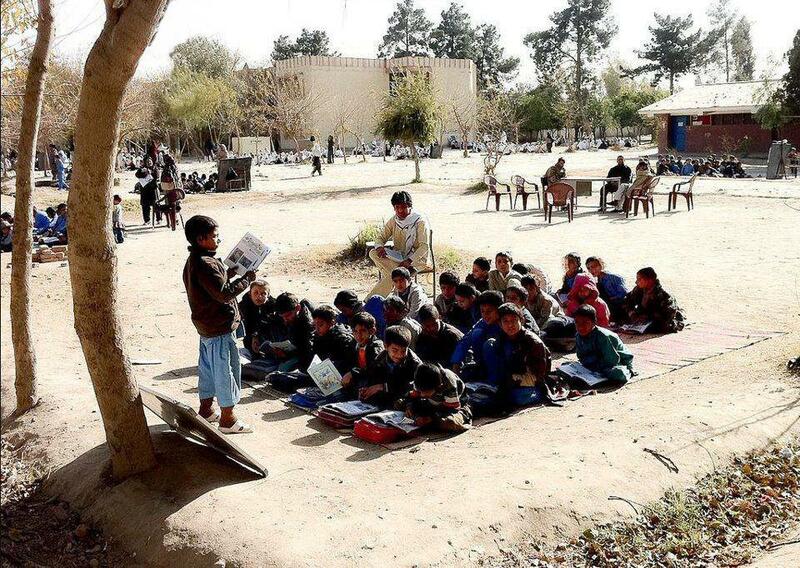 Villages of Pakistani country side mostly have open air schools. Not that all such schools i.e. 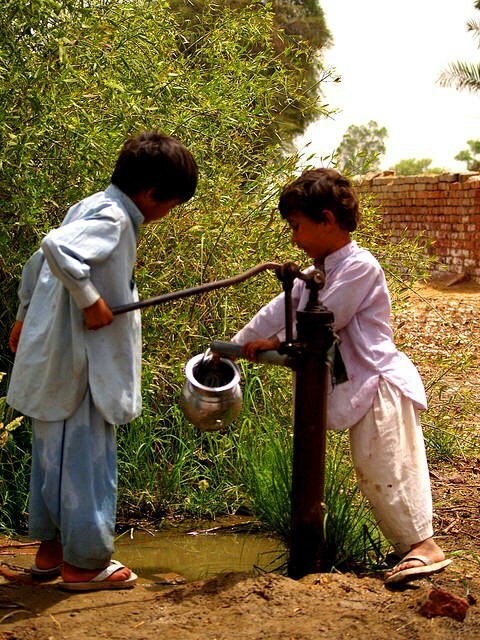 the institution of basic learning in rural Pakistan are without roof and boundary. Mostly now they do have buildings of their own. But in winter when its too cold inside, teachers and students both prefer to sit outside in the open to enjoy the congenial atmosphere. Same is the practice in summers when class rooms of pucca school building get too hot. [Here in a village school, monitor reads the lesson for his classmates while the teacher is sitting on a chair to supervise the progress of learning]. 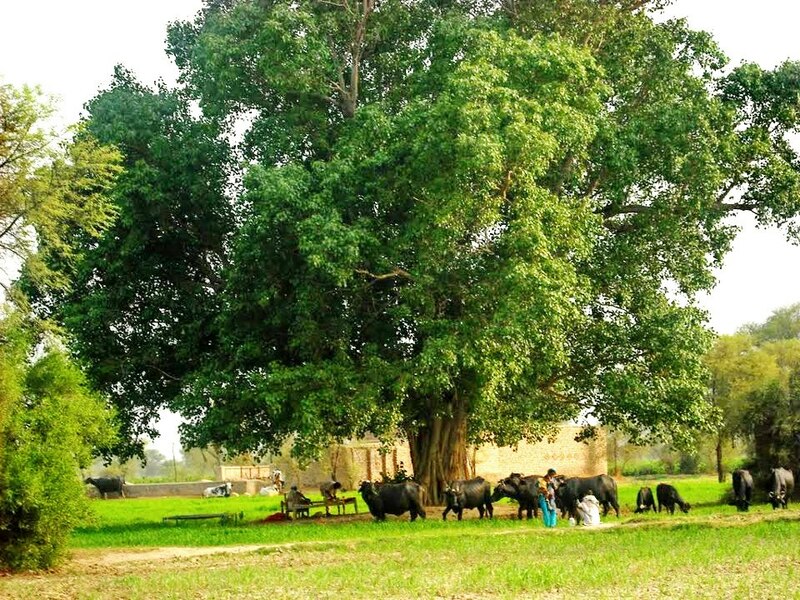 Again a painting-like village dwelling alongside a huge shady tree..
A girl milking the buffalo: Whereas modern urban patterns are changing the culture in rural Pakistan, by and large the village folk still prefer to meet their economic needs through self-reliance. Keeping a buffalo, if one can afford ensures a steady supply of pure milk, butter and yogurt. 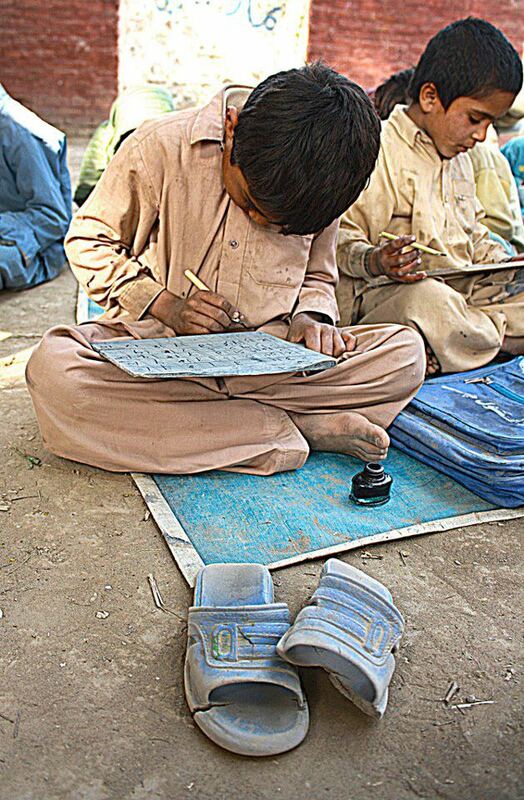 Student of a village elementary school practices writing on his note-book folded like a ‘takhti’, while his buddy writes on actual takhti (the most economical and practical method of training young pupils to learn the basic alphabets and counting). As said, villagers are attuned to self driven economic tools and needs. 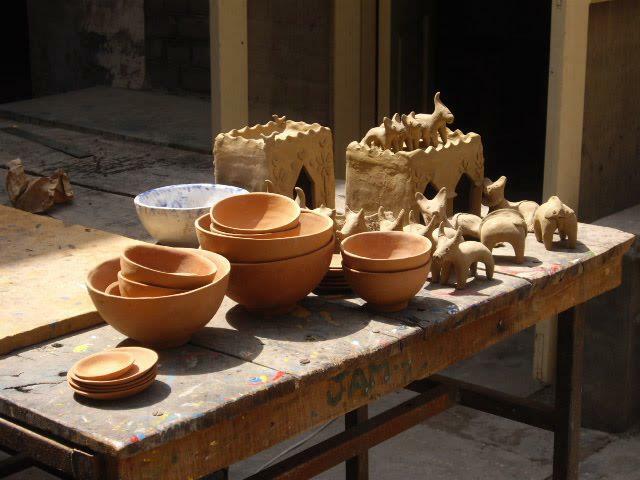 To cater the needs of the children and the households in villages of Punjab, local potters make kitchen utensils, as well as children toys made of terra-cotta. Pottery is one of the oldest human skills – we can even call it an art form, as it takes lot of training, aesthetics and hard work to create such items. Punjab has a thousand years old tradition of pottery tracing back its origin to Moenjo daro and Harappa civilisations around the Indus. Archaeologists have discovered many such toys made by Harappans about 3300-1700 years BCE. Though not much liked by urban kids, these whistles and horses are a favorite shopping of the village kids. Some pieces are so beautiful you could call them real pieces of art. A young mother puts her child in a makeshift crib. In my home town Faisalabad, I have seen many such cribs which the lady workers from villages of Chiniot use to sooth their children. The ‘device’ makes the child enjoy swing as well as the gentle cool breeze, when a mother off and on pushes such swing. A vendor with his different selling items (these are mostly the home-baked biscuits, mints, candies, and other paraphernalia), all put in pouches, hanging on his worn out bicycle, is waiting for his young customers. A richly painted truck probably hauling agricultural produce from a village to grain market in a large city. 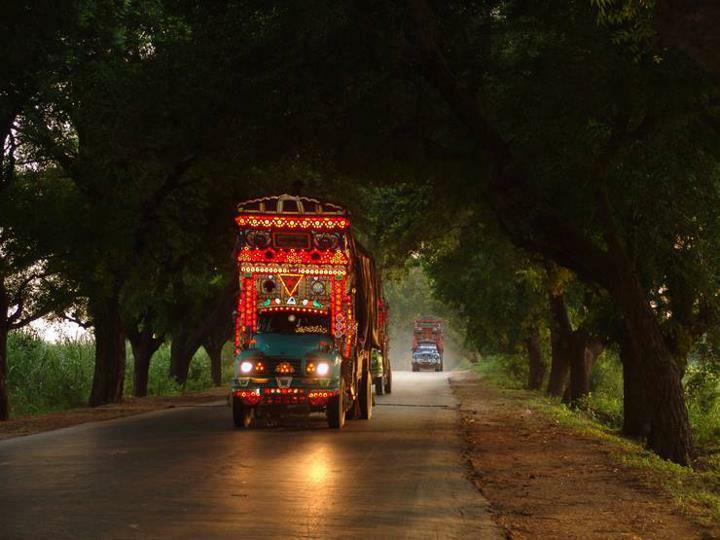 Such trunks are a common sight on Pakistani roads and are acclaimed worldwide for their fabulous art. The show remains on display 24 hours, without any fee. See also ‘Huge Brides on the Move’. 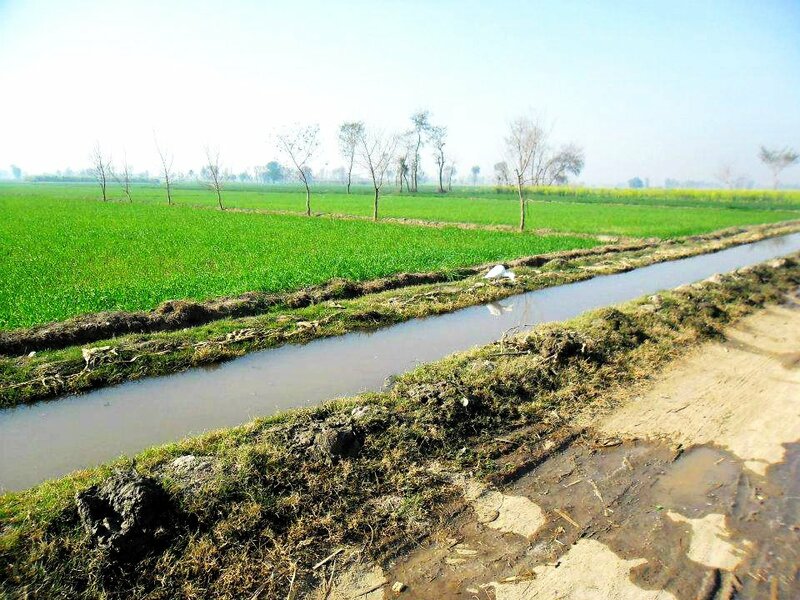 Almost all villages in Punjab are covered through an intricate network of irrigation canals. This maze of canals and their distributaries have mainly contributed to the green revolution in Pakistan. Thanks to this world-famous canal system, Punjab with its vast, expansive, fertile landmass not only fulfills the needs of all other provinces of Pakistan but also is the principal provider of food grains to Afghanistan. In a lifestyle where everybody depends on the community, the Punjabi village folk are accustomed to their centuries old custom of ‘catering for home, near my home’. Therefore, instead of hiring services of prestigious catering cos. in the cities (which are anyway beyond their reach) they utilize the service of village “nai’s” or the hairdressers for this purpose. I‘m still at a loss to understand the logic why should a hairdresser go for cooking dishes at family functions but this is what they have been doing since ages. 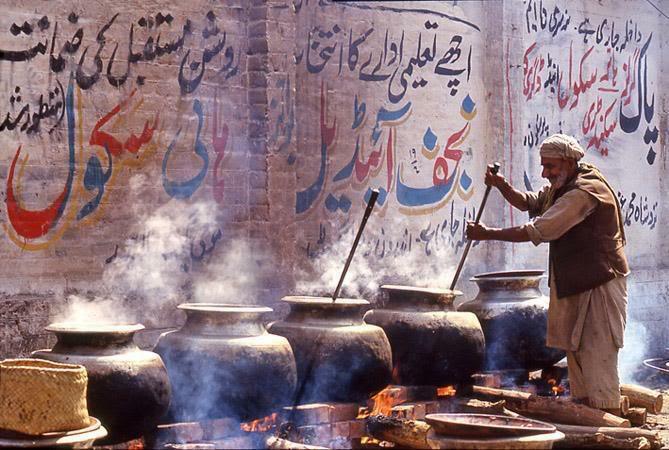 And believe me, these village hairdressers cook dishes which are not just a slogan but are real finger licking good. Whatever they cook in a deg (a large-sized cooking vessel) can surely become the envy of a top-notch chef in a four start hotel of the cities. As always, click the individual image to view in full size. We do not claim exclusive rights on all articles, images or videos published on this site. The sources we use to create our articles, images, videos etc. are credited with a proper linkback. However, we do host material from unknown authors we receive via mails, from friends and our readers. If you own copyrights to some material and you want us to remove it from our pages, contact us to claim your ownership and we will either credit you, or if you wish – completely remove the content.